From comic books to cartoons, witche(r)s to wrestling, Netflix has A LOT to offer this year. 2018 was yet another massive year for Netflix, with the company reaching new levels of hype and seemingly dropping a new original movie, documentary, and TV show every weekend - if not multiple at once. Estimated to have spent anywhere from $8bn - $13bn on original programming, the streamer launched buzzy new hits like The Haunting of Hill House and Chilling Adventures of Sabrina, alongside returning favourites such as GLOW and (the sadly now cancelled) Daredevil. Despite its rising debt (or rather, thanks to it), Netflix aren't slowing down at all this year. Instead, their production of original content is going to ramp up even further. It's only February and we've already had A Series of Unfortunate Events, The Punisher, Unbreakable Kimmy Schmidt, The Ted Bundy Tapes, and most recently the superb Russian Doll, but that's only the start. 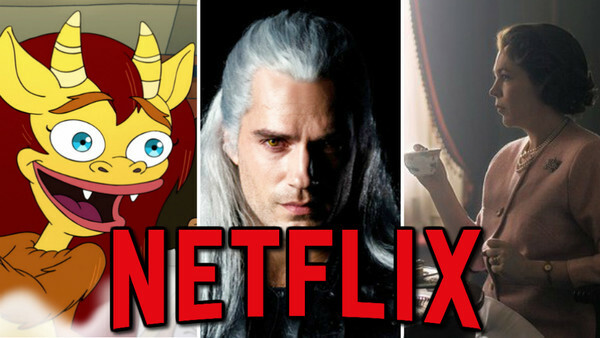 There are some beloved series and established hits coming back, alongside brand new properties sure to set the internet aflame for one glorious binge-watching weekend. Netflix may be cancelling their Marvel shows, but they're not giving up on comic book properties altogether. February sees them launch The Umbrella Academy, an adaptation of the comic of the same name from My Chemical Romance frontman Gerard Way. The show takes place in an alternate version of Earth, and finds an estranged adopted family of superheroes come back together after their father's death in order to solve the mystery surrounding it. The impressive cast includes Ellen Page and Robert Sheehan, and promises an interesting mix of superheroes, family drama, and comic book visuals.